Fifth Sunday in Lent ~ March 22, 2015 – Rev. Canon Dr. William J. Danaher Jr.
A couple of years ago when I was visiting London, England, a friend wanted to show me a place that she found particularly sacred. She asked me to meet her in Leicester Square which is known as the entertainment district of London. When we use that term “entertainment district,” we mean the broadest meaning of the term “entertainment.” If you want a massage, if you want to see a show, if you want to eat some pho noodles, that’s the place to go, Leicester Square—if you want to enter a tourist trap. Cocteau once wrote in the 20s that the only way that he could perform his art, the only way he could write a poem or paint a picture or write a play or a novel, was by trying to somehow keep himself “in the air.” And because he lacked any kind of wings or mechanism of flight that meant that he only could proceed by taking a deliberate “series of fallings.” He flew by falling. And that is a powerful image of his art and of the artist. When Cocteau was nine years old, his father committed suicide; he left home when he was 15, and he published his first book of poetry when he was 19. And he was addicted to opium for decades. So in his work there are these themes that recur constantly of dislocation, of isolation, of disease, of death, of suffering. And at the same time in his work there are also these themes that come by way of angelic messengers of reunion, of forgiveness, of acceptance, of peace. And those themes, those reconciling themes, began to present themselves more fully in his life as he was able to step away from his addiction and re-unite with the Catholic faith of his youth. And he did this as only an honest French artist could. 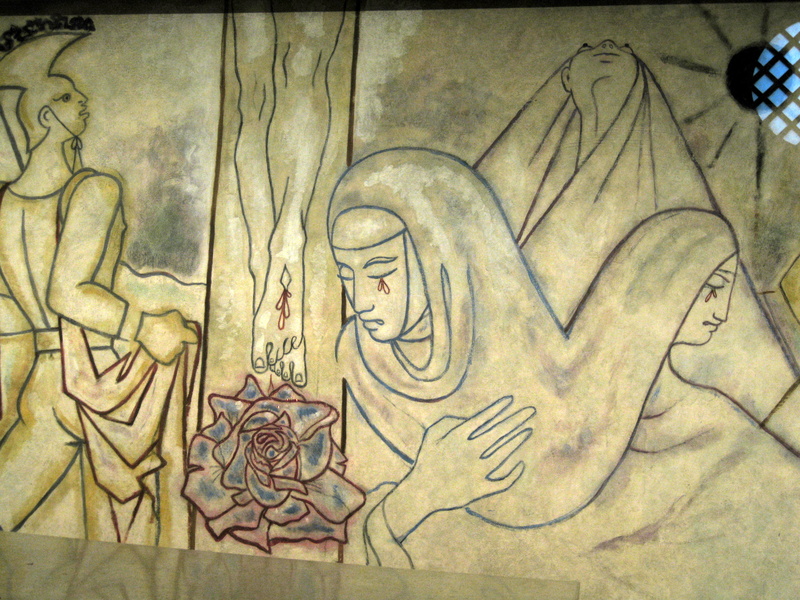 That title, “the yet unfinished work of grace,” I think captures the key to the mural itself—the key to everything that Cocteau was trying to somehow gather up in this mural. I’ve given you a close-up to look at today. The mural originally had three scenes from Mary’s life: The Annunciation, The Crucifixion and The Assumption. And I’ve taken you to that point, the focal point of The Crucifixion. And here you see that element of that power that Christianity has to bring together beauty and suffering, estrangement and reconciliation, restlessness and peace, all of these things are pulled together. Jesus is bleeding from his wounds, but those wounds are shaped like tears. And Mary and Mary Magdalene are crying tears that are the color red, the color of blood. Finally there is the third Mary here. The tradition has three Marys at the feet of Christ while he was being crucified, Mary, Mary Magdalene and Mary Salome. Salome is Hebrew for disciple. Mary Salome is looking straight up into the sky and her eyes are literally bulging with awe and maybe a bit of terror at the awesome work of God. The centurion to your left or your… yeah that’s your left. The centurion is looking at Jesus and he’s saying those lines from Mark and Matthew, “Surely this is the Son of God.” And we see Jesus here dying at the moment of his death. Ironically what’s interesting about this mural to me is that we never actually see Jesus; the mural actually ends right above Jesus’ knees. What Jesus looks like above there is left to the viewer to construct. We only see Jesus with his feet wounded, nailed to the wooden cross. The one key to this passage, to this whole mural, to this tableau I think is that rose, that final moment in which there is a sign of a deep reconciliation. And that rose symbolizes both Jesus and Mary. The rose was considered the queen of flowers, but it was also meant to suggest the ability to bloom in the midst of thorns. So I think that here in this mural Cocteau has given us this incredible vision of what it means to fall in order to fly when it comes to the Christian faith. The point of connection that he finds in this mural is that he can approach the wounds of the crucified one by going through the wounds of his disciples and seeing that sympathetic connection. 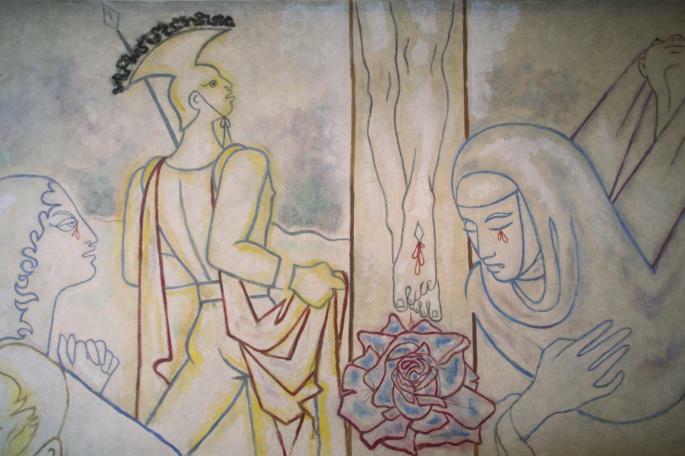 Cocteau sees Jesus only by looking through the lens of his own suffering to the suffering of the crucified one, and there he finds a glimpse of reconciliation and peace and acceptance and healing and hope and life. And finally in our Gospel for today, we have some visitors who want to see Jesus. They go through the normal channels and Jesus says, “No, the only audience you’re going to see and the only witness you’re going to see is my death. For unless a grain fall into the soil and die it remains just a single grain, but once it dies and is buried it will bear much fruit.” The only Jesus these visitors can see is the Christ who has experienced death and resurrection. The only way for them to see Jesus, for us to see Jesus, is by tracing that pattern in our own lives of falling in order to fly. If you were a painter, how would you portray the crucifixion? What is the color of your tears? What does the lens of your wounds see? How are you God’s unfinished work of grace? May these questions remain alive for us as we begin to trace the pattern of Jesus’ death and resurrection next week. Amen.